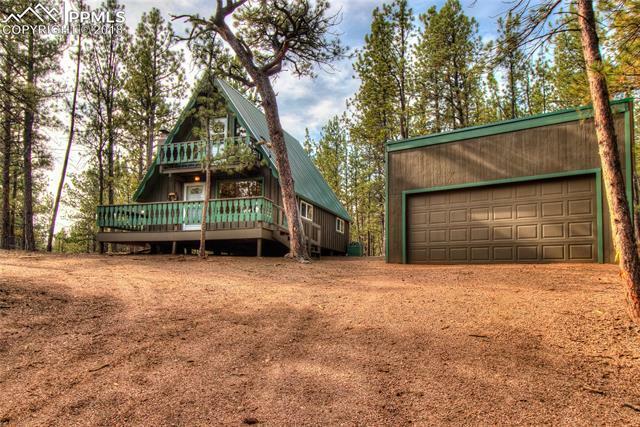 Adorable, completely remodeled, mountain retreat. Located just 20 min from Woodland Park, 5 minutes to Lake George, and about an hour to Breckenridge, this A Frame retreat is the prefect weekend resort for you! Enjoy privacy on the wooded 1.41 Ac lot, and views from your front or back porches. Inside, this cabin is beautiful. Updated fixtures, open kitchen shelving, new appliances, and fresh paint throughout. Upstairs hosts 2 bedrooms, 1 with a walkout balcony. The property backs up to an open forest.